If you could pick any city on earth to settle down and customise bikes in, we think it’s a safe bet that Singapore wouldn’t be at the top of many lists. In a similar fashion to Hong Kong, Singapore has very little tolerance for vehicular modifications and a few of our Pipemates who live over there have told us that you can be defected for something as minor as having non-standard rubber on your rims. 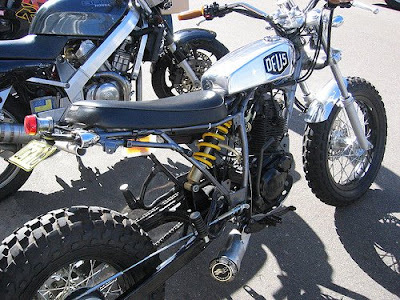 And heaven help you if you were to do something crazy like add a new exhaust or tank – that’d result in your bike being impounded. 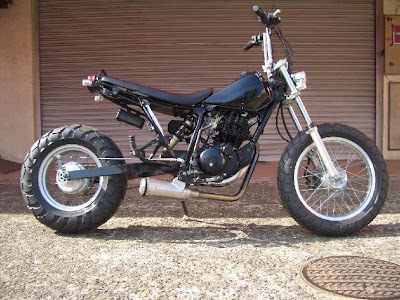 So as you are gazing over the sweet, sweet lines of this little Yammie TW keep in mind that it’s creators, Matt and Merv from Vicious Cycles Singapore, risk severe punishment if they were ever caught riding it in public. Apparently, the last biker who dared do this was forced to watch the movies “Wild Hogs” and “Torque” on an endless loop for an entire month while he was simultaneously made to delete all his browser’s cool bike bookmarks one by one. And that’s not all. Afterward, when he still wouldn’t swear against his beloved custom bikes they forced him to stay in a remote house at the end of a very long, windy road. They then gave him a Wrenchmonkee’s original with all the bells and whistles and covered every inch of the road with lard as they waved goodbye. Bastards. 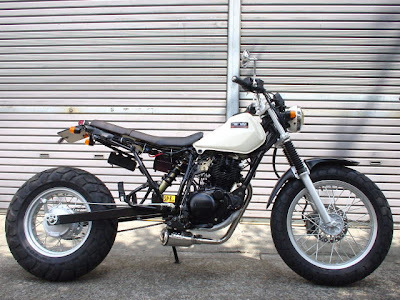 If you know what the Bones Brigade, Animal Chin and Slime Balls are, then you’ll probably appreciate this TW200 more than others. 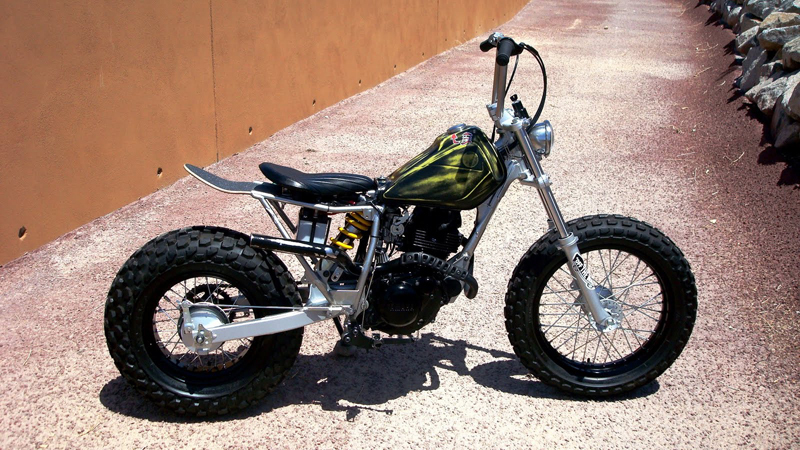 Built by Zack Taylor from Machine-13, who is a young builder from Phoenix, Arizona. Zack has managed to merge three of his passions into one business – skateboarding, art/tattoo’s and motorsickles. You see, Machine-13 is a tattoo shop, custom shop and every bike goes out with his unique ‘skate style’. Zack’s trademark is using skateboard wheels as tail lights and he also loves chopping up skate decks to use as rear fenders – it might not be to everyones taste but you have to give him points for originality. 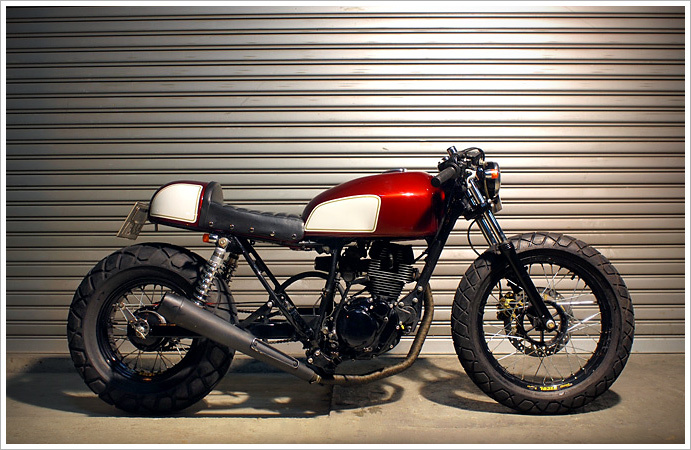 It’s been a while since we’ve posted a bike from this Japanese shop called Flake motorcycles. They are the masters of fine paint work. Just check out some of their amazing tanks. 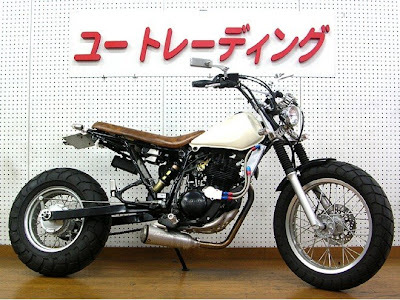 This TW200 has been done in true Japanese style. Like so many sweet TW200 found on the streets of Tokyo. That retro paint work is beautiful.